Flue gas purification systems and sewage treatment plants were built to deal with the situation, but even these remedial measures seem absurd from today's perspective, because they are technically very complicated and also extremely expensive to operate. The focus has therefore shifted to eliminating emissions right from the start. During the first 100 years of industrial chemical activity, up to the middle of the 20th century, it was believed that emissions in the form of exhaust air, waste water and waste could be absorbed by the environment. The main interest was in new dyes, fertilisers and plastics. Only when the serious environmental damage started to become obvious in the 60s, did people begin to think differently. Today the focus is on using cheap raw materials which also allow the target molecule to be arrived at directly and elegantly. 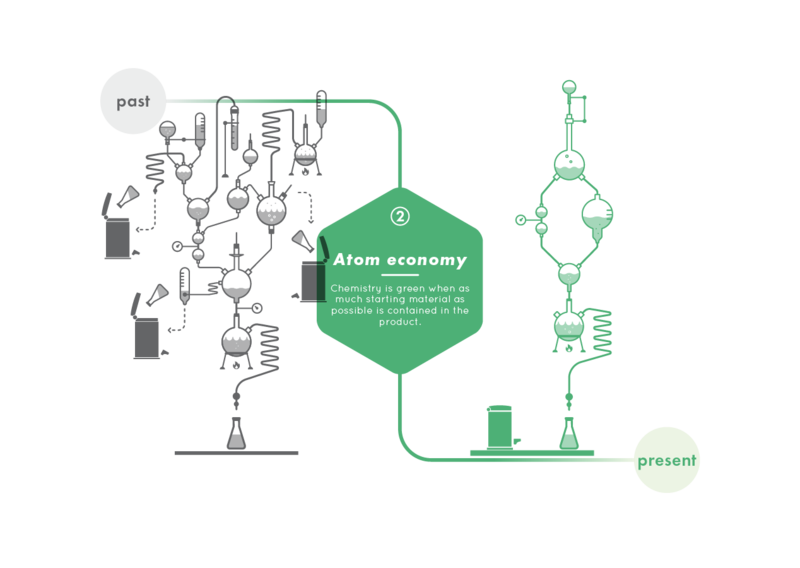 Ensuring that all the atoms used are also part of the desired product leads to atom-economical syntheses, and much less waste. An example of this is vanillin, an important flavouring agent and an intermediate product that is obtained inexpensively from wood, a renewable resource. 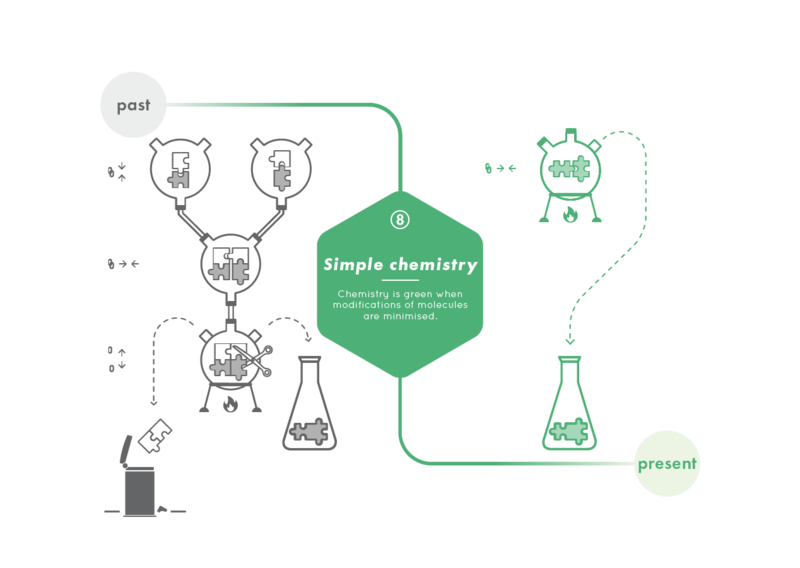 Chemical products can be produced from a variety of starting materials and very different methods of synthesis. Small blocks from a few atoms are used in complicated procedures to synthesise molecules such as active pharmaceutical ingredients, aromatic flavours and high-performance plastics. Attention used to be paid mainly to the function of the target molecule and the manufacturing costs. Ethylene oxide is currently produced from ethene with the air that is freely available, or with pure oxygen. There is no longer a need for chlorine in its preparation, so that a particularly toxic intermediate step can be circumvented and large quantities of waste avoided. Silver catalysts make this direct reaction possible. Biological systems for the production of chemicals are increasingly being used; the solvent is then mostly water, the temperatures are low, and toxic substances are no longer needed. 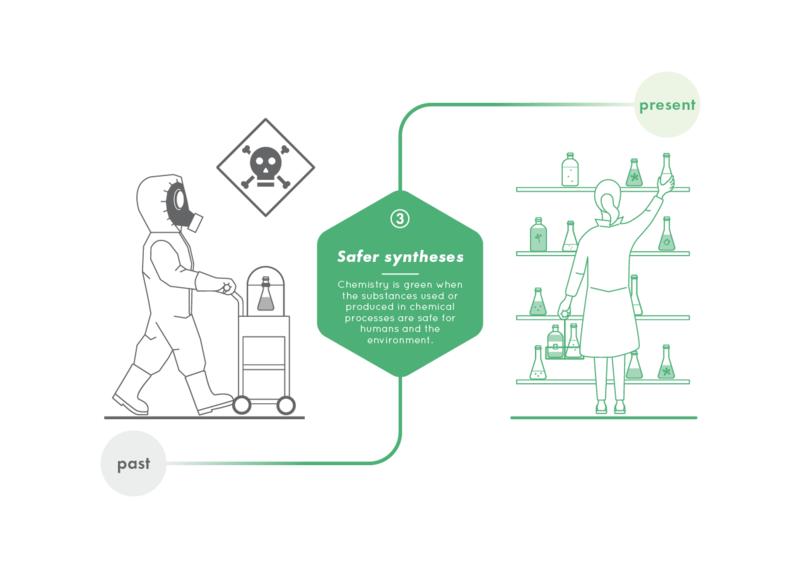 When it came to producing new substances, the risks associated with the chemicals involved were seen as less important than the desired properties or functions of the product. Surface-active substances (tensides) are required for the production of detergents and cleaning agents. A part of these chain-like molecules is often made up of ethylene oxide. In the past chlorine and lime, which are highly reactive and toxic, were used for the production of ethene. Because it is very toxic, cadmium sulfide has no longer been used commercially as a pigment for paints in Europe since the 1980s. Instead, bismuth vanadate, which is non-toxic and has better coverage, is used in combination with various yellow organic pigments. Because of its exceptional brilliance, stability and colour fastness, cadmium sulfide was long used for "postal yellow" in Germany. Cadmium sulfide has nevertheless been classified as very toxic, or more exactly as carcinogenic, mutagenic and hazardous for water. Today solvent-based coatings can be replaced by water-based dispersion paints which are equally effective. The environment is protected and there is no hazard for painters. 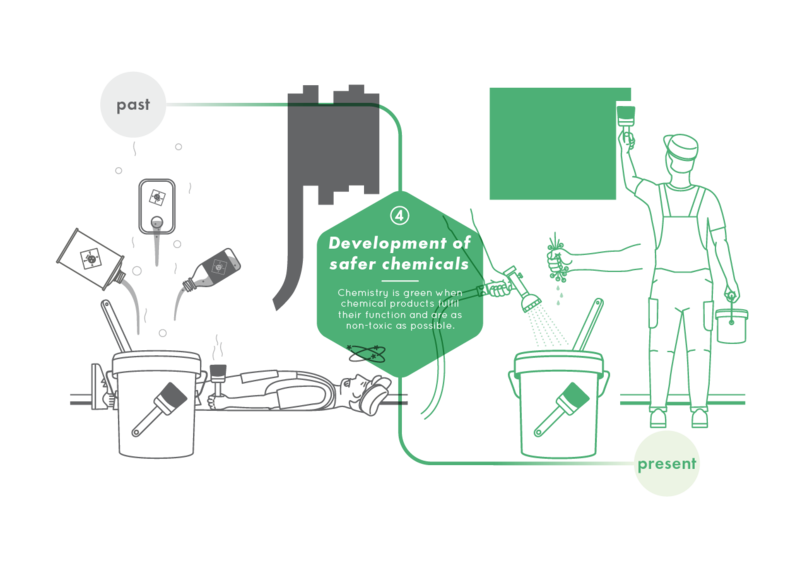 The chemical industry is increasingly succeeding in replacing solvents in manufacture and use by more sustainable systems. For example, substances such as carbon dioxide and water are proving to be excellent solvents at elevated temperatures and pressures (in the supercritical state). Caffeine has long been extracted from coffee in this way. Solvents are substances in which one can dissolve other substances. They are essential in the manufacture and use of chemicals. For example, paints were long produced on the basis of non-aqueous solvents, which are often dangerous, toxic to humans and the environment, and pollute the atmosphere. Of course, chemical plants today are extremely well insulated and thus save both energy and the associated costs, but measures to increase energy efficiency go far beyond that. It is often possible to find imaginative new synthesis routes; like a hiker who discovers a new pass making it possible to cross the Alps with less physical effort. Today, microorganisms are already in use that utilise solar energy for the production of chemicals. From an economic point of view, it has always been interesting to have faster chemical reactions. In general, however, this requires higher temperatures. In chemistry, there is a simple rule of thumb: chemical reactions occur about twice as fast when the reaction is warmed by ten degrees. However, higher temperatures also mean higher energy consumption. At the end of the 20th century people realised that fossil fuels are finite. 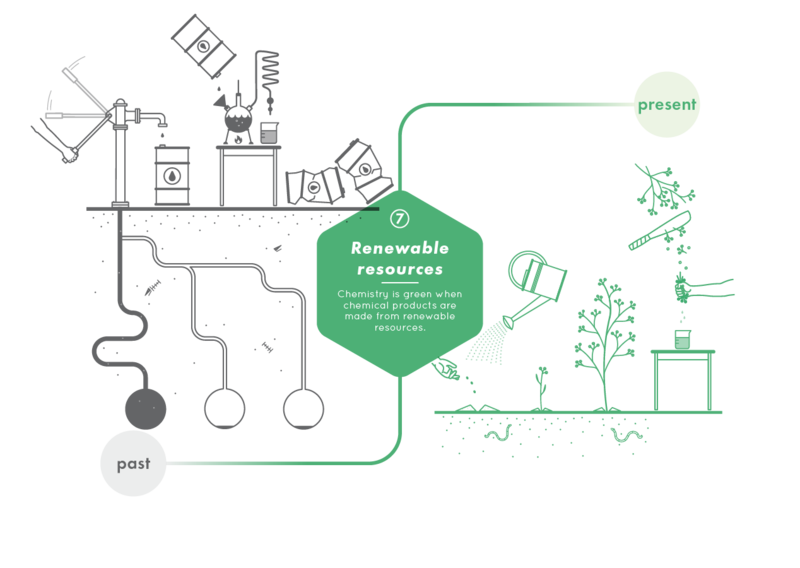 A new era began for the chemical industry with the use of renewable resources. Bio-chemical processes have enabled the production of new materials and fabrics. One of these highly interesting materials is polylactic acid, a versatile bioplastic. 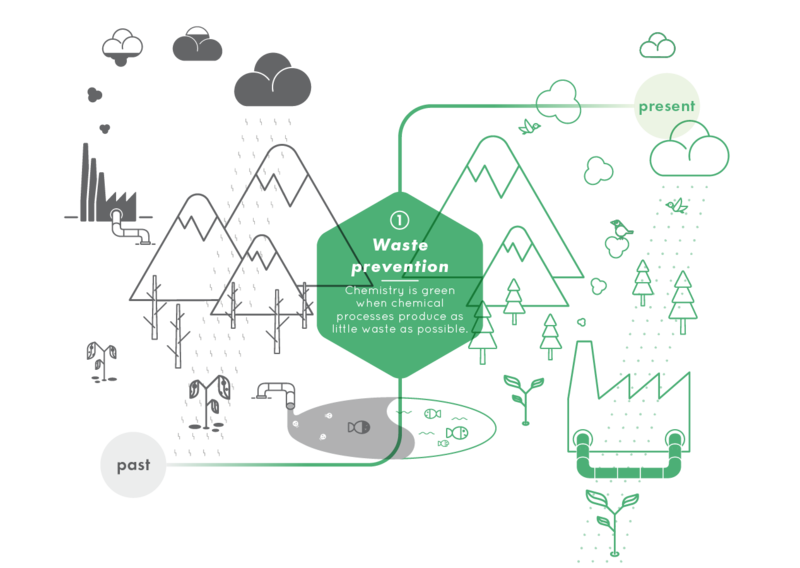 The economic use of biological structures such as that of wood, or the production of fuels from biowaste in biorefineries, is also attractive. Petroleum rapidly replaced coal after the Second World War as a raw material for chemical products, and later natural gas came into use. Although only about 10% of energy-rich fossil fuels are used for chemical purposes, the range of chemical products made from them is nevertheless huge, and includes dyes, fertilisers, pesticides, plastics and pharmaceuticals. Phenol is still produced from benzene, but nowadays only propene and oxygen are required for modern catalytic processes. Acetone can be produced at the same time as phenol, and this significantly contributes to a more economic process. 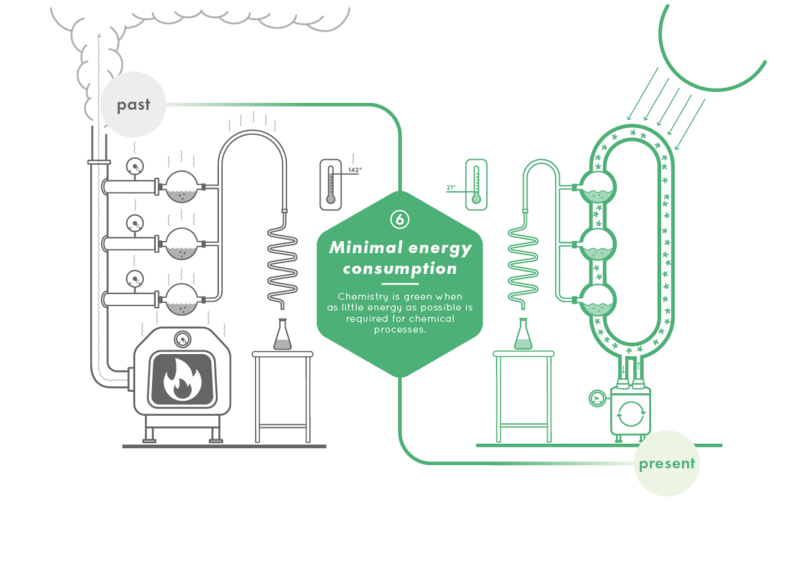 The synthesis no longer involves unnecessary detours, and large quantities of waste are thereby eliminated. 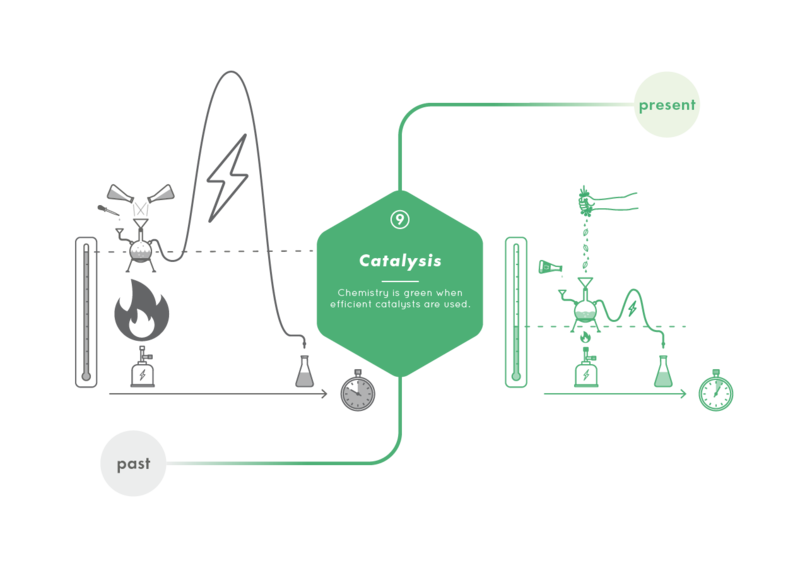 Furthermore, selective catalytic processes often make it possible to adopt direct reaction pathways. One of the starting materials for the production of bakelite, the first important plastic, was phenol. Initially this was made from benzene in a very complicated process with a number of steps. In natural product or medicinal chemistry, it is often necessary to follow even more complicated synthetic strategies to synthesise the desired molecule. Sometimes it is necessary to protect parts of a molecule at considerable expense before another part can be changed. 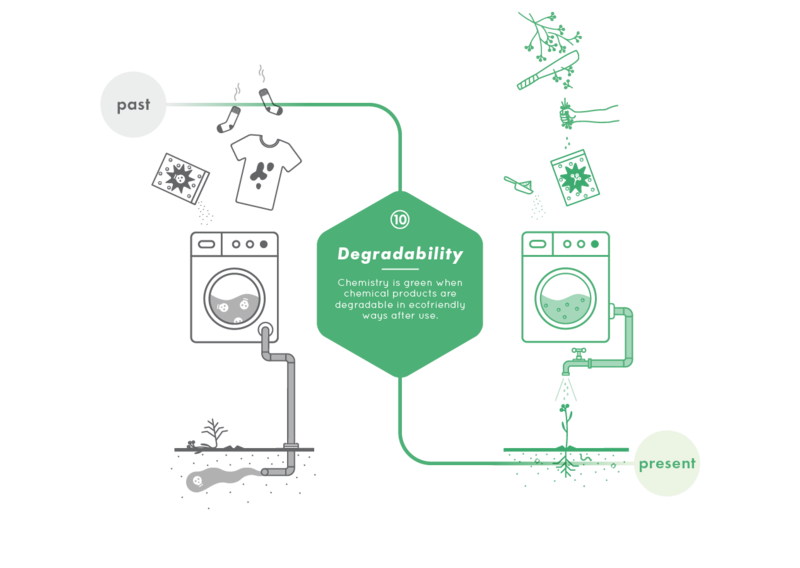 With increasing knowledge of the biodegradability of tensides, only easily biodegradable substances are nowadays used in detergents and cleaning products in Europe. In the case of alkylbenzene sulfonates, for example, only a part of their structure needs to be changed for this purpose.  In addition to biodegradability, the raw materials required are also taken into account in the context of tensides. Renewable resources such as natural fatty acids from rapeseed and palm oil are therefore increasingly replacing fossil raw materials. Heavy-duty detergent and household cleaners contain surface-active substances (tensides) which facilitate the detachment of dirt from textile fibres or surfaces. Previously alkyl benzene sulfonates were one of the substances used in their production. However, in the 60s it was discovered that these substances are biologically very poorly degradable. In 2002, the US regulatory authority for pharmaceuticals (FDA) launched an initiative for real time control (PAT) in pharmaceutical production, which has implications for the entire chemical and pharmaceutical industry. In particular, the development of computer and laser technology, along with increasing miniaturisation, has enabled major advances to be made. It can be assumed that all of the chemical processes will eventually be monitored at molecular level in real time, and thus more efficiently controlled. In chemical production, the quality of intermediate products and finished products is examined by taking samples. These analyses are often very time-consuming, but essential, for example to determine the progress of a reaction. This is critical both for the duration of the reaction and for quality and economic efficiency. 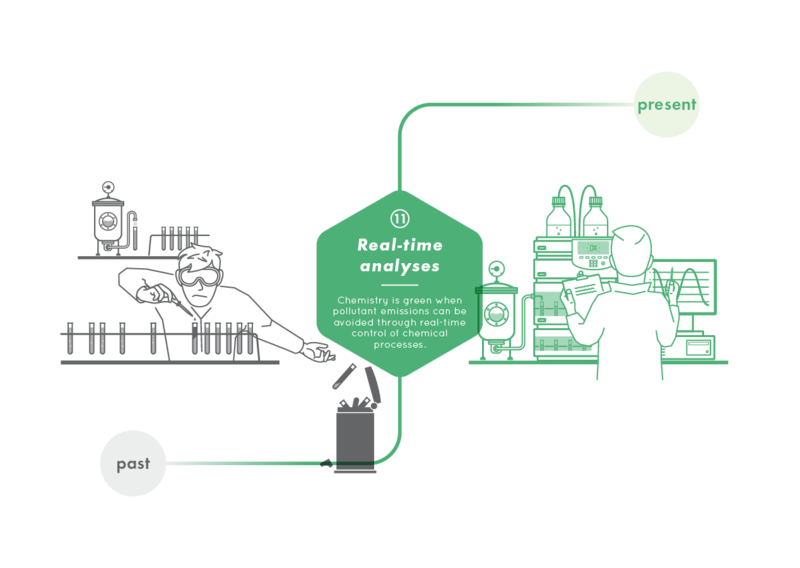 Real-time analysis was developed at an early stage to obtain continuous rather than selective information about production processes. 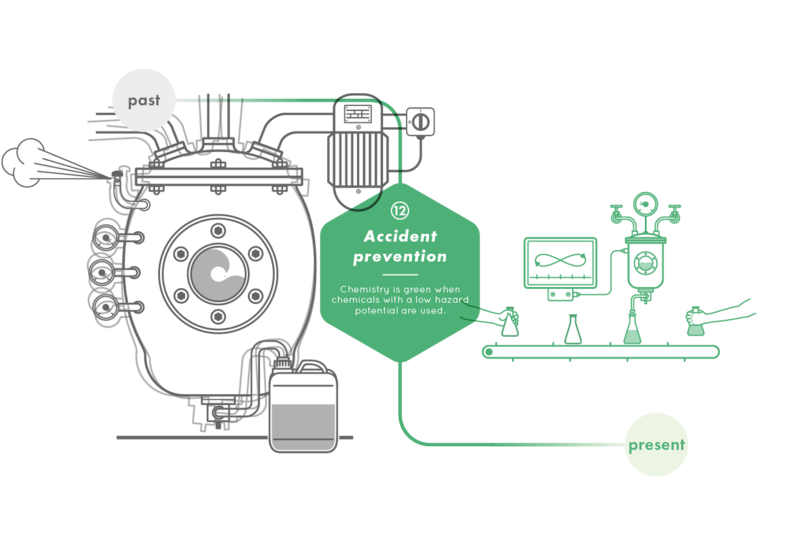 With a better understanding of processes and more effective methods of risk analysis, the dangers posed by chemical processes can today be better assessed and accordingly reduced. For example, it is now known that some hazards can be completely eliminated by rearranging the order of reaction sequences. Furthermore, through continuous reaction control, large volumes of product can be prepared in microreactor systems with very little apparatus, and without the hazards normally involved in working with such large quantities. 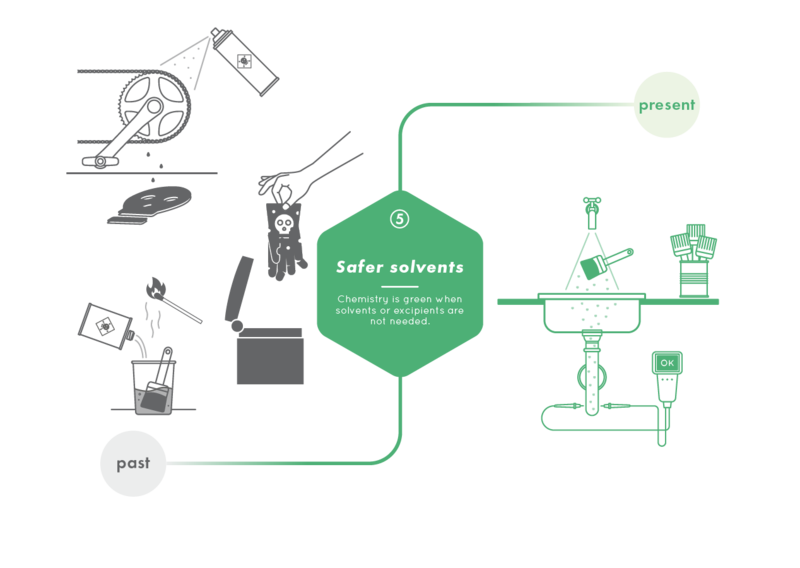 Chemical processes were used with great caution so that the desired products could be safely manufactured. Unfortunately, unforeseen incidents repeatedly occurred. Hazards inherent in chemicals, such as toxicity, flammability or instability, sometimes caused considerable damage.